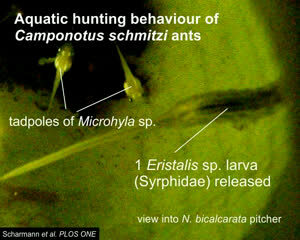 An insect-eating pitcher plant teams up with ants to prevent mosquito larvae from stealing its nutrients, according to research published May 22 in the open access journal PLOS ONE by Mathias Scharmann and colleagues from the University of Cambridge and the University Brunei Darussalam. The unusual relationship between insect-eating pitcher plants and ants that live exclusively on them has long puzzled scientists. The Camponotus schmitzi ants live only on one species of Bornean pitcher plants (Nepenthes bicalcarata), where they walk across slippery pitcher traps, swim and dive in the plant's digestive fluids and consume nectar and prey that fall into the trap. Though the benefits to the ants are obvious, it has been harder to tell what exactly the plants gain. However, plants that harbor the insects grow larger than those that do not, suggesting a mutualistic relationship exists between the two. In this new study, researchers demonstrated a flow of nutrients from ants to their plant hosts, and found that plants colonized by insects received more nitrogen than those that did not host ants. Ants appeared to increase the pitchers' capture efficiency by keeping traps clean, and also protected the plants by actively hunting mosquito larvae that otherwise bred in pitcher fluids and sucked up plant nutrients. 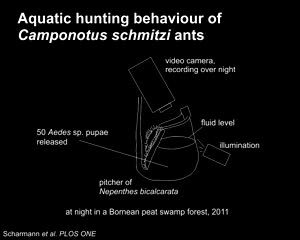 "Kneeling down in the swamp amidst huge pitcher plants in a Bornean rainforest, it was a truly jaw-dropping experience when we first noticed how very aggressive and skilled the Camponotus schmitzi ants were in underwater hunting: it was a mosquito massacre!" says Scharmann. 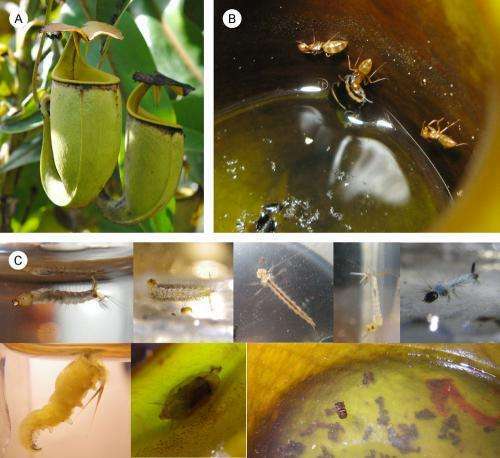 "Later, when we discovered that the ants' droppings are returned to the plant, it became clear that this unique behaviour could actually play an important role in the complex relationship of the pitcher plant with the ants."